A public dedication ceremony for the DeTour Reef Light Station state historical marker commemorating the historic offshore lighthouse was held on Saturday, September 28, 2013, at the marker site located at the MDOT scenic parking area, known as Hot Dog Stands Beach, on M-134 five miles west of DeTour Village and five miles east of the M-48, where the lighthouse is first sited from the highway. After the 30-minute ceremony, supporters gathered at the Mainsail Restaurant in DeTour Village to celebrate the event. State historical markers commemorate significant individuals, organizations, places, and events in Michigan history. These markers help communities throughout the state promote, preserve, and present their history for the education and enjoyment of residents and tourists of all ages. The Michigan Historical Marker Program operates under the direction of the Michigan Historical Commission and the Michigan Historical Center, agencies within the Department of Natural Resources, and partners with the Eastern Michigan University Historic Preservation Program to document and create the text for the markers. The State Historic Preservation Office determines whether the subject matter is eligible for listing in the State Register of Historic Sites. The program’s first marker was dedicated in 1955 at Michigan State University in East Lansing. Since then, more than 1,600 state historical markers have been erected, making Michigan’s program one of the largest privately funded historical marker programs in the nation. For more information on the state marker program visit www.michmarkers.com. DRLPS submitted application to the Michigan Historical Commission for the historical marker in December 2012, and worked with the state for six months for the proper documentation and review of the text. DRLPS will fund the manufacture of the aluminum casting marker and is 42î wide by 54î high with two posts. A ìsponsor plaqueî stating ìDeTour Reef Light Preservation Societyî hangs from the bottom of the marker. 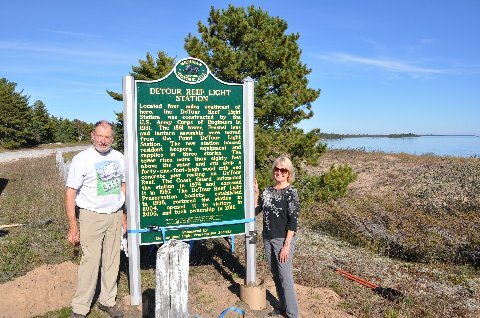 The marker represents the dedicated efforts of scores of people to restore and preserve the DeTour Reef Light Station and make it available to the public, and honors its significance to the stateís rich maritime history. Thanks to DeTour Drummond Building Center for taking delivery of the marker and to X-Factor Construction for volunteering to install it. The marker dedication occurred during the 15th year anniversary of the Society (1998-2013). Located one mile offshore in northern Lake Huron at the entrance to the St. Maryís River in DeTour Passage connecting to Lake Superior, the DeTour Reef Light Station stands as a proud icon to Michiganís maritime history since 1931. The DRLPS, established in 1998 by local volunteers, has restored the lighthouse and offers public tours since 2005, and is the sponsor of the historical marker. For information on DRLPS, please visit www.DRLPS.com. Located where the St. Mary’s River enters Lake Huron from Lake Superior, DeTour Passage separates the Upper Peninsula from Drummond Island. It has long been a choke point for Great Lakes shipping. Anticipating increased traffic as a result of the locks planned at Sault Ste. Marie, the U.S. Lighthouse Service built an onshore light station on Point DeTour in 1848. As vessels grew in size, DeTour Reef, which extends a mile from Point DeTour in twenty feet of water, became a greater shipping hazard. In 1929, the Lighthouse Service decided to replace the onshore light with a station atop the reef. 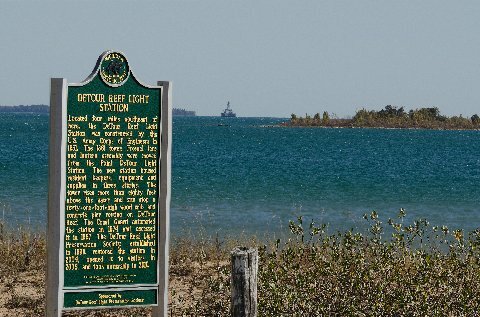 DeTour Reef Light Station is one of only six reef light stations in Michigan. Located four miles southeast of here, the DeTour Reef Light Station was constructed by the U.S. Army Corps of Engineers in 1931. The 1861 tower, Fresnel lens and lantern assembly were moved from the Point DeTour Light Station. The new station housed resident keepers, equipment and supplies in three stories. The tower rises more than eighty feet above the water and sits atop a forty-one-foot-high wood crib and concrete pier resting on DeTour Reef. The Coast Guard automated the station in 1974 and excessed it in 1997. The DeTour Reef Light Preservation Society, established in 1998, restored the station in 2004, opened it to visitors in 2005, and took ownership in 2010.